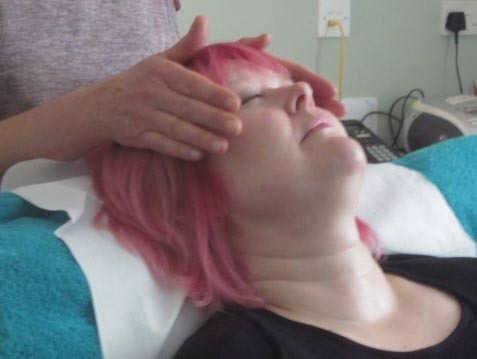 Reiki is the universal life Energy channeled through the Practitioner to the client order to balance and heal the emotional mental, physical and spiritual state. This holistic healing energy has been discovered and practiced in Japan by Dr. Mikao Usui at the beginning of the last century. Since then the attunement has been given and received from teacher to student. is a very subtle and profound therapy and enhances the body’s own healing power. Reiki is a balancing energy which helps us and our body to keep in equilibrium and health. By balancing the Energy of every cell in the body, it enhances the body’s own healing power. The client lies in a relaxing position fully clothed while the practitioner gives the energy in entry points (chakras) by holding the hands over the body or lightly laying them on the cloth. Reiki helped me to overcome a phobia of dogs. In my childhood and as a teenager I had two experiences, where dogs barked right into my face and I got frightened to death. This left me with a panic fear whenever I saw a dog and I made diversions or turned back to avoid them. Working in the community I had to face this situation at one point and I saw the necessity to work on myself in order to overcome my panicky fear. At the course the teacher encouraged us to give Distance Reiki to past experiences, to be healed. I did this for a week on a regular basis and made sure I came in contract with dogs of friends. Observing my own reaction, I noticed quite quickly, that my panic fear was gone. I am still weary of dogs strange dogs. Now it is even possible for me to care for a guide dog in Training..